What is better than coming home after a long, hard day than opening up your door and having your pet greet you at the door, so excited that you’re home? What about when you get down on the floor for some petting and scratching, and your pet lovingly licks you on the face… don’t you just LOVE “pet breath”?! Did you know bad breath in pets, like humans, is called halitosis, and is an indication of dental disease? Did you know you can slow or prevent the formation of dental disease? A good dental routine for your pet starts with you, the pet parent. February is National Pet Dental Month. To get things started, here are some facts about what is going on inside of your pet’s mouth. Just like us, dogs and cats have a full set of baby teeth. These teeth are known as deciduous teeth, and are replaced with their permanent adult teeth. Dogs have 42 permanent teeth. Cats have 30 permanent teeth. Halitosis is the most common sign of periodontal disease. Your pet’s “bad breath” may be telling you something. Small breed dogs are most likely to have dental disease because their teeth are often crowded in their smaller mouths. Cats can get dental disease, too. Cats can also be affected by a very painful condition called tooth resorption. Some dog breeds are at a higher risk for developing periodontal disease, such as Chihuahuas, poodles, and dachshunds. Statistics show that approximately 80% of dogs and cats will develop some degree of periodontal disease by age 3. It is the most common disease in adult dogs and cats. Since the mouth has such a good blood supply, bacteria in the mouth can travel through the bloodstream and damage other organs including the liver, heart, and kidneys. Good dental hygiene can add 2-4 years to your pet’s life. 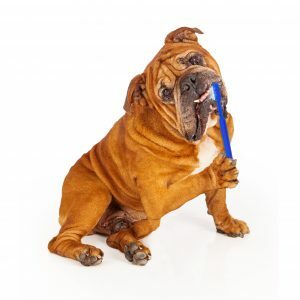 Brushing your pet’s teeth can delay or prevent dental disease! Just think: what if you NEVER brushed YOUR teeth? Proper dental care is one thing you shouldn’t brush off. Call us today for your dental exam and your customized oral health treatment plan at 563-285-7891. Don’t forget to ask us about our current dental special.